Why/how did your love for vintage clothing evolve? I've always been fascinated with history and the past. When I was little, I used to read the American Girl books and immediately formed an attachment with the '40s. Molly was the first American Girl doll I received and I always found her books the most interesting. When I got a little older I started to watch classic films. By the age of 10 or 12, I had made my way through most of Hitchcock's major classics and fell in love with the director and the era of which the films were being made in. I think it was sort of a gradual procession. I've always loved old things -- one thing has just lead into another. I definitely think my fashion sense was influenced early on by those Hitchcock films, considering Edith Head was the fashion director/designer on so many of his films. What was your first vintage purchase ever? The first vintage purchase I can remember is a beautiful 50's black taffeta dress I bought right after I got my driver's license. I am sure I bought vintage things before this, as my mom and I would take trips to the craft and antique mall. But, this is always the first thing that comes to mind. I still have the dress and hopefully will wear it this summer! Name a few of your collections and how long you have been collecting each of them? My most two favorite things to collect are vintage shoes and vintage magazines. I just recently got hooked on collecting vintage shoes after I bought a pair a year or two ago and wore them for the first time. I must say, compared to shoes today, the heels of the '40s and '50s are much more comfortable and I now understand how women could wear them all day. I have always had a liking for vintage paper products. It first started with collecting vintage Community Silver ads when I was in middle school. 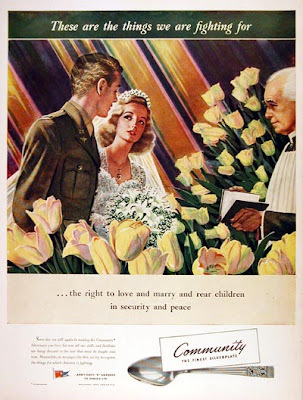 I loved that they were mostly brides and WWII gals in the ads. This lead into just buying the whole magazines. I then discovered vintage movie magazines and now I am addicted!! I also collect vintage linens (mainly tableclothes and tea towels), patterns, and dishes. Do you only wear vintage clothing? No. I have to admit, I have a mini obsession with Ugg boots. I know a lot of people hate these things and I can understand why. When they first came out, I too thought they were the ugliest things ever. But then I heard how comfy and warm they were and had to try a pair out. Now, seven pairs later, I am addicted. I also have an affinity for high end bags, which I think are fun to pair with different vintage clothing items. I don't dress vintage every day, but I always have some element of vintage in my outfit; whether it is my purse, shoes, a pin; there is always at least one part of me that is vintage. Some days I want to dress very period accurate and other days I feel like mixing and matching to get an eclectic effect. Do you buy clothes at the mall? Sometimes I do. I'll buy jeans there or button up sweaters that I can pair with my vintage dresses. I am more of a fan of Target than the mall. Why do you wear vintage clothing? I most wear vintage because I just love the era and wish I was living then. I really believe I was born in the wrong era. Maybe I was a WWII bride in a past life or something! :) Something about the '40s and '50s just really appeals to me. I also dress vintage because I like being girlie. I have always been a girlie girl playing house with my dolls. I really like wearing dresses and some vintage clothing can really a lot for a gal's figure. I also like that with vintage you can get killer deals and don't have to spend a lot to look like you did. What is the craziest/most interesting experience you've had while out thrifting/vintage shopping? I haven't witnessed anything super wild, but I did get a good laugh at this one guy at one of the last estate sales I went to. This happened at the farm house estate that I have mentioned a few times, where I got all the great farm dresses. I was standing in line with a vintage store owner who I see a lot at estate sales(he is super cute by the way!) and we were chatting it up when all of a sudden this guy makes his way to the front of the line with a fold up chase lounge, a pad for the lounge, and a nasty old blanket. He was #2 in line (we had a list going since the estate sale company was NOT accepting street numbers...we decided to keep some sort of order to avoid chaos). He proceeds to unfold the lounge and set it all up in front of the entire line. He then lays down and went to sleep. Me and the vintage shop guy could barley keep our laughter under control. He took pictures and sent it to all his friends. It was quite the experience now that I think about it. Neither him, nor I, had ever seen such an act in all of our estate sale going experiences. Who goes shopping with you? 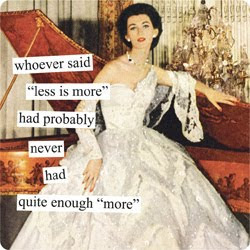 What kind of reaction do you get from friends/relatives about you passion for vintage? I mostly go thrifting alone. My brother will often drive me places so I don't have to, but I normally do the hunting of objects down by myself. Occasionally, he will come in, but it's mostly just me. When it comes to estate sales, my mom will go to the bigger sales with me to help me grab stuff and beat the competition. My family has slowly come around the the idea of me purchases the great majority of my items second hand. I think my dad has kind of always been into it since he is into vintage cars. I have gotten my mom into the vintage stuff and she now share a passion for vintage dishes and linens with me. My brother still doesn't quite get it, but he is such a good sport for going with me and being my buddy. My friends don't really seem to have an opinion either way. Most of them think it's "cute" that I'm into old stuff and some have even wanted to attend flea markets with me to see what it's all about. The thing I hear from them most is how dressed up I am. Hmmm... this is a hard one. I can't seem to narrow it down to just one, so I'll do two; a summer and a winter. For summer it would be my mend and make do dress. I really just adore this dress. I fell in love with the fabric and the style of the dress when I found it at an estate sale and while it was in shreds, I knew I had to at least attempt to put it back together. I have yet to see a dress quite like it. Last summer it became my go to dress and will probably continue to be this summer as well. For winter, my favorite thing to do is wear vintage tops with sweaters paired with cute jeans and shoes. It can get pretty cold here in Michigan and some days I just don't feel like wearing a dress. This outfit is a good example of what many of my winter outfits look like on the colder days. I love this shirt. My mom found it at the farm house estate sale and it is in fact a 1940's pajama top. I really like pairing things together that aren't suppose to go together. I have been known to wear a taffeta slip as a dress!! How many vintage hats do you have in your collection? I have between 15 and 20. I can still remember when I bought my first hat; I was a sophomore in high school. I was at a thrift store and came across this Union Made black hat with sequins on it. I paid $5 for it and then began my fascination with vintage hats. And just how many coats do you actually have? I think the number is between 20 and 25 (I know I have at least 20, I've kind of stopped counting there). I guess this could be considered a collection, an addiction, or even a problem. My only excuse is that I like having options and I like having my coats match/coordinate with my outfits. What color would you paint your kitchen, bathroom, living room? I use to think I would always want a yellow kitchen, since it is my favorite color. 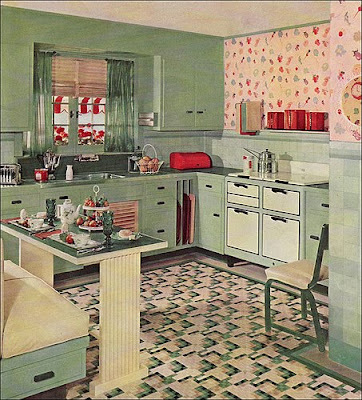 But, now I think I might like a red or a jade green kitchen. I think it depends on the house and the kitchen..and what color most of my stuff is. The same would go for my living room and bathroom, all depends on the house. There is also some really great repro wall papers out there that I might consider using. Check out Pam's website for more on retro home ideas. I do know that I want to use mostly all vintage furniture and really have a good mix of vintage and modern. I can't wait until I can buy my first home!! 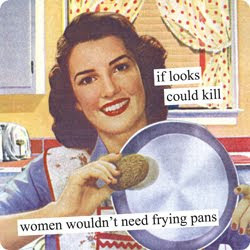 I really adore the above picture..isn't is a great kitchen??! Thanks so much to everyone that posted a question!! There were a few I didn't get to, but will instead do a dedicated post to -- a few of the questions sparked some post ideas in my head! Gracias!! for taking time to answer our questions, I absolutely love Your blog. really enjoyed reading your answers to these questions. PS: that is an AWESOME kitchen, alright! This is such a great post - was fun reading your answers :) Love the mend and make do dress! And that IS a terrific kitchen... oddly enough, I've been thinking for awhile about painting my kitchen either jadite green or celadon green, to complement my red kitchen things. Great interview! That's a lot of coats...wish I had room for more myself!